Corineus – Under the influence! According to British medieval legend and myth, the island now known as Britain was once named Albion after an exiled queen named Albina. She was the eldest of a family of sisters who had been exiled from their homeland in Greece, though some versions of the story say Syria. How this came to be is an outlandish and in many ways disturbing story, found in the 14th century poem, Des Grantz Geanz (“Of the Great Giants”) which was popular in its time and probably best read as an allegorical work. British traditions of the Middle Ages were heavily influenced by the work of Geoffrey of Monmouth in his book Historia regum Britanniae (The History of the Kings of Britain) written about 1136 that tells that when Brutus of Troy arrived on the island that that been revealed to him in the Prophecy of Diana, he found it was just as she had described, being a green and fertile land populated by only a few giants. Brutus and his Trojans fought the giants until at last the biggest and strongest of them was the only one left alive. His name was Gogmagog and Brutus had deliberately saved him to fight his own champion Corineus who thrilled at such challenge. Geoffrey of Monmouth never said where the giants had come from or why the island was called Albion. This perplexed medieval scholars and a story evolved that attempted to explain this discrepancy. According to medieval tradition, before the fight began Brutus was said to have asked Gogmagog who he was and of the origin of his people. Gogmagog was said to have given the Trojan a fantastic tale revealing the origin of the giants and how the island had been named, “Albion”. Presented next is a retelling of the story Gogmagog allegedly told Brutus and has been sourced from several medieval and Anglo-Norman accounts and more recent works. According to Gogmagog the story of the origin of the giants of Albion began 3,970 years after the world began. In a country now called Greece there ruled a very powerful king. This king was very noble and very righteous and the head of a strict patriarchal state and society. His queen was a very beautiful woman and they had a very happy marriage and were blessed with thirty beautiful daughters who were said to be very tall in some accounts. The giant confessed he did not know all their names but knew the eldest, tallest and most influential of these was named Albina. He told Brutus, that in accordance with the custom of the time and of their society the king decided that their daughters had come of sufficient age to marry. He then decided without consulting his daughters which daughter would marry which of the many kings, princes and rulers that would be a good political match for his realm. All thirty of the daughters were then married to their allotted husbands with much ceremony and fanfare. However, his daughters were said to be very proud and strong-willed women who wanted their own well-being and desires met. They were fiercely independent and hated the idea of being married to men who were not of their own choosing and did not love. To them it was an indignity and an insult to have to be subjugated in any way to any man regardless of how rich and powerful he was or whatever benefits it might bring for their father’s kingdom. They vowed they would be no man’s possession and instead would be the rulers of all men regardless of their status. To further these vows they plotted together in secret and hatched a most extreme plan. 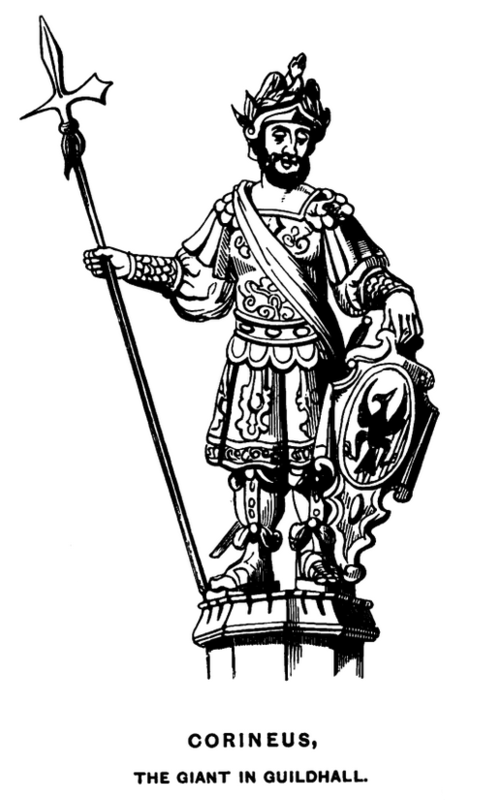 In medieval legend Corineus was held to be a descendant of the Trojans and a great warrior who became the founder and first Duke of Cornwall. Geoffrey of Monmouth in his book The history of the Kings of Britain identifies him as the leader of a group of warriors descended from a group of Trojans who settled along the coasts of the Tyrrhenian Sea in exile after the fall of Troy. In a dream Brutus had been told by the goddess Diana to seek out Albion which was populated by giants and make it his home. Although the book was popular in its time it is not regarded today as a reliable history book. This shows how attitudes change with the times and how legends are made, though some may call it fiction. However, we will allow the reader to make up their own mind and look at the story Geoffrey tells about the founding of Cornwall by exiled Trojans. According to Geoffrey, Brutus was a descendant of Aeneas, a Trojan prince, and had freed many Trojans who had been enslaved in Greece after the fall of Troy. He had become their leader and traveled far and wide with them having many adventures before meeting up with another band of exiled Trojans along the coast of the Tyrrhenian Sea.